With Three-Year Revenue Growth of 522% Percent, and being the top ranked Oil and Gas Land Services Company in the Energy Industry as a whole! NEW YORK, August 15, 2018 – Inc. magazine today revealed that Peak Land Services (Peak) is No. 946 on its 37th annual Inc. 5000, the most prestigious ranking of the nation’s fastest-growing private companies. The list represents a unique look at the most successful companies within the American economy’s most dynamic segment—its independent small businesses. Microsoft, Dell, Domino’s Pizza, Pandora, Timberland, LinkedIn, Yelp, Zillow, and many other well-known names gained their first national exposure as honorees on the Inc. 5000. Peak was the highest ranked Land Services Company within the Energy Industry which is a huge accomplishment considering how many other startup land groups have popped up over the last 6 years. 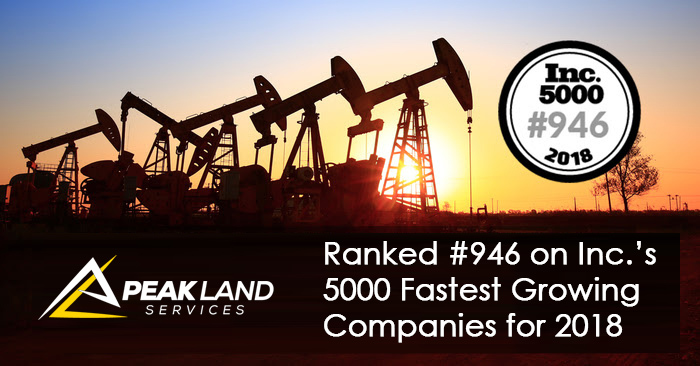 Peak ranked in the top 10 within the Energy Industry in Texas as a whole, being ranked 6th, coming in right behind another Midland-based company named Octane Energy. Peak Land Services specializes in oil and gas land services, providing both privately backed management teams and publicly traded E&P Companies with a wide variety of oil and gas land services including mineral title, mineral leasing, identification of open acreage, prospect generation, A&D, surface and ROW acquisitions, due diligence, GIS project management, and overall land support.